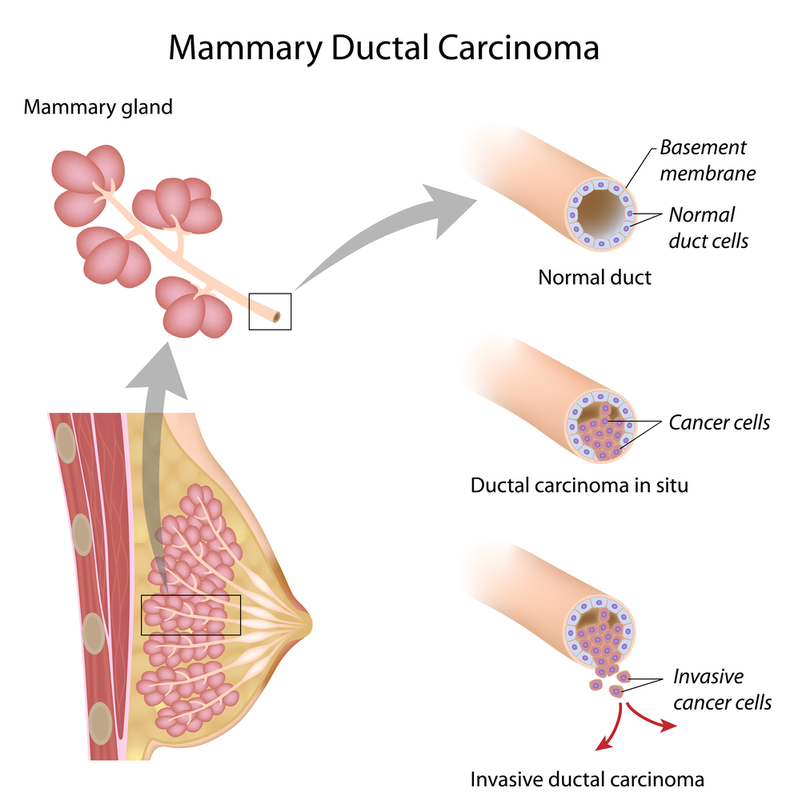 Ductal carcinoma in situ (DCIS) was the focus of a blog two years ago entitled “To treat or not to treat?” The disease describes abnormal but non-invasive cells found in the milk ducts (see diagram below). The word “non-invasive” implies that DCIS is not immediately life threatening but there is still considerable doubt regarding the optimal course of treatment. In the past week a paper entitled “Breast cancer mortality after a diagnosis of DCIS” appeared in JAMA Oncology that has stirred the controversy. Steven Narod from Toronto and colleagues investigated data from more than 100,000 women who received a diagnosis of DCIS between 1988 and 2011. Their study was important because “women with DCIS, or stage 0 breast cancer, often experience a second primary breast cancer (DCIS or invasive), and some ultimately die of breast cancer.” Note that all the women were treated and yet 3.3% of them died of breast cancer within 20 years of diagnosis. Narod stated: “Our work shows that DCIS has more in common with small invasive cancers than previously thought. In these cases, we’ve found that there’s an inherent potential for DCIS to spread to other organs.” The article has drawn the attention of Harvard radiologist and screening advocate Daniel Kopans, who has written an opinion piece for AuntMinnie.com, as well as the “Room for Debate” section of The New York Times. Kopans took issue with the fact that there were three different treatments – lumpectomy only, lumpectomy plus radiation, and mastectomy – and yet there was probably selection bias because the types of lesions were not evenly distributed among the treatment groups. He also objected to an accompanying editorial by Laura Esserman who suggested the ideal way to treat DCIS was simply to ignore the disease instead of treating it aggressively. Kopans concluded by suggesting the reduction in invasive cancers recorded in the USA over the past two decades was likely due to the removal of DCIS lesions. When there are two strongly polarized views (ignore DCIS / treat all DCIS), often both are correct. The middle way is to treat high grade DCIS in younger women, and to provide older women with low grade DCIS a reassuring pat on the shoulder.